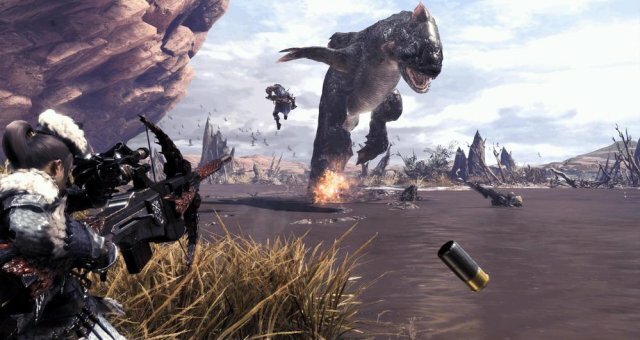 Monster Hunter: World - All Palico Gadget Locations Guide. There are a total of six Palico Gadgets that you can get in the base game of Monster Hunter World. Each gadget allows your Palico to do different things in battle and some of them are extremely helpful. This gadget will show you where to find all palico gadgets. Vigorwasp Spray - This is the default gadget for your Palico and is obtained automatically. Flashfly Cage - This is obtained from the first zone, Ancient Forest. To obtain it you need to find the Bugtrappers. They get be found way up the top of the ancient forest, as shown in the video. Follow the one who runs away from you to receive the gadget. Shieldspire - This is obtained from the second zone, Wildspire Wastes. To get the gadget you need to find the Protectors, who are found in a small hole in the floor at the back of the map.Talk to them and then complete their quest to catch the other protectors who got lost to get the Shieldspire gadget. The lost protectors are marked on the map. Coral Orchestra - This is obtained from the thurd zone, Coral Highlands. Find the Troupers in this zone and then defeat the Shamos they are riding on. You will now get an objective to follow the scoutflies to the home of the Troupers. Once you arrive, you'll get a quest to hunt two Tzitzi-Ya-Ku. Complete this quest and you'll receive the Coral Orchestra gadget after the rewards screen. Plunderblade - This one is the trickiest to get, as it requires you to do a few things and then wait an undetermined amount of time for the plunderers to spawn. First, look at zone 13 on your map and set a waypoint to the researcher. Talk to him and he'll mention the Ocodragon carrying prey back to the cave he is in. Now, you need to wait for an Ocodragon to bring a Legiana to this cave. Once that happens, a Plunderer will spawn by it. Follow the scoutflies and then when it runs up the wall, you need to place some raw meat on the floor to get it to come out. Once it comes down and brings it's friends, talk to them to receive the plunderblade. Meowlotov Cocktail - This is the final gadget and you can only get it after you have the other ones and you have unlocked the Elder's Recess zone. Talk to the Lyrian Researcher in Astera and he'll give you a critical bounty to find 10 Gajalaka tracks / doodles. You can only find the Gajalaka in the High Rank zones, they will not spawn in the low rank ones. Open your map and switch it to small monsters so you can find them on the maps easier. Go to them and they'll usually be 1 or 2 tracks / doodles around them. Once you have 10, go back to the researcher and talk to him. He'll give you a new bounty to go to the Elder's Recess at night. Go there and find the researcher on the map. You need to sneak past the Gajalaka in the camp reach the leader at the end to recieve the Meowlotov Cocktail gadget. Use the ghillie suit to make the sneaking very easy.